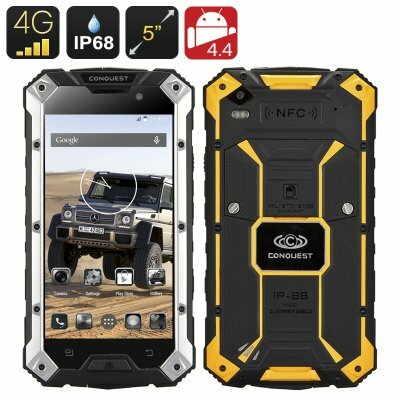 Successfully Added Conquest S6 Plus Rugged Smartphone - IP68 Waterproof, Dust Proof, 4G, Dual SIM, MTK8732 Quad Core CPU, 2GB RAM, NFC (Yellow) to your Shopping Cart. 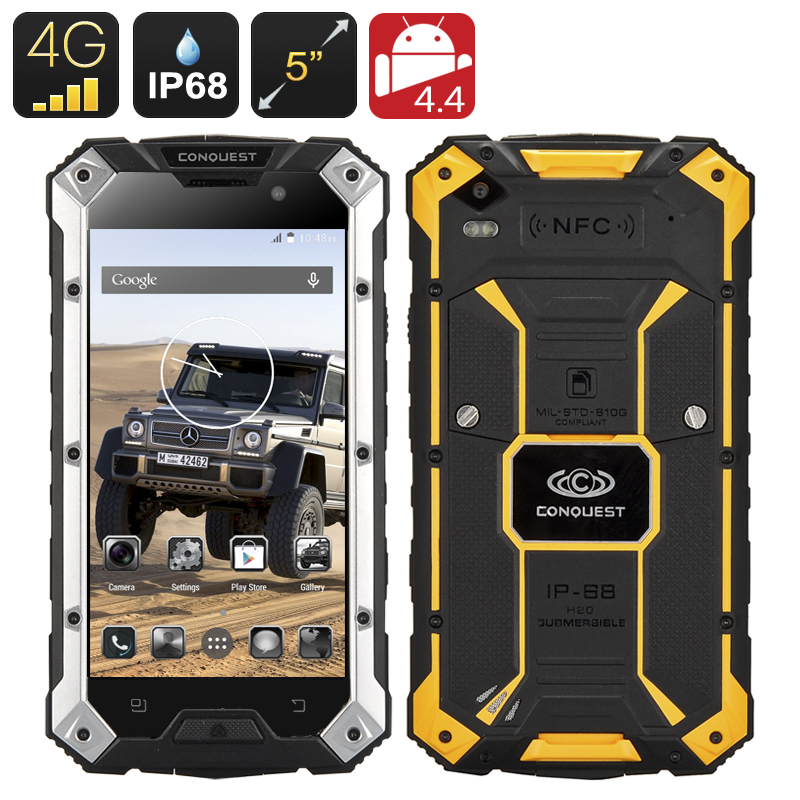 The Conquest S6 is a stylish rugged smartphone, which will definitely convert you to the rugged phones advantages. In addition to the incredible design, this model offers an impressive capacity of onboard memory, a large bright display, fantastic cameras and of course that IP68 waterproof and dust proof rating. With this sort of p[rotection the phone is completely water as well as dust proof, and can function for quite a long time in depths of more than one meter making it suitable for any hardships and trials. Being equipped with a bright and convenient 5 inch display with 720p resolutions the Conquest S6 Plus showes every image in great detail and quality. There is enough raw power for the device to perform all the tasks set before it thanks to its MTK8732 quad core processor. When it comes to battery life the 4000mAh battery brings a long life and plenty of usage time. The Conquest S6 Plus has one of the most fascinating cameras in its arsenal making it stand out from other rugged smartphones, an rear facing 8 megapixel camera can achive 13Mp images with interpolation that allows you to always capture every memorable moment. This rugged Android 4.4 smartphone not only supports 2G and 3G bandwidths, but also 4G FDD-LTE, which makes it one of the most advanced rugged smartphone available today. Android 4.4 KitKat is the operating system that comes pre-installed on this rugged smartphone and provides a whole array of functions and features. Multi-tasking is essential when using a smartphone and Android 4.4 KitKat takes the system performance to its optimal by optimizing memory usage when several apps are running simultaneously and making the touch screen respond faster and more accurate. With all these features, you can see why this rugged smartphone is a success. It combines everything you ever need in a smartphone and more. This is the Conquest S6 plus get ready to be amazed. This product is in stock now, we guarantee next working day shipping and offer a 12 months warranty on all our products. Brought to you by the leader in electronic devices as well as wholesale rugged smartphones, Chinavasion..
16th of September, 2015: No earphones in package content anymore.